The 100 is an American 60 minute scripted science-fiction television series, which kicked off on March 19, 2014, on The CW and is broadcast every Tuesday at 20:00. The show is currently in its 6th season. The 100 Season 6 release date is slated for April 30, 2019 on The CW. Sign up to track down the status of the next seasons of The 100. Over the last four seasons The 100 have fought to survive against unimaginable odds, only to see the world end for a second time. 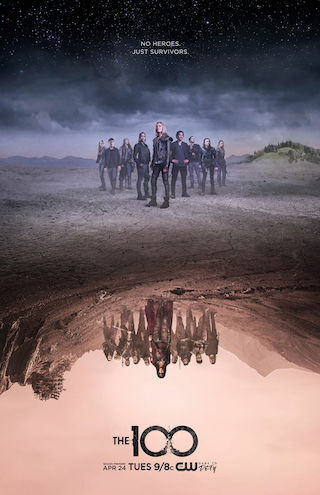 Season five begins six years later, with our heroes still separated: Bellamy's team in space, Clarke on the ground, and hundreds trapped in the bunker below. But when a massive prison ship descends upon the last survivable place on earth, The 100 must come together to reclaim their home. As two armies converge on one valley, alliances will shift, friends will become foes, and the march to war threatens to destroy all that's left of the human race. Can our heroes break the cycle, or is humanity doomed to repeat the past? In this epic battle for survival, one thing is certain: there are no good guys. The team on the ground flights to survive the threat they face on the new planet. Meanwhile, Raven must join forces with an unlikely ally to save everyone on board the Mothership.